This week we’re gettin psychedelic!!! The last Saturday has been a doomed day for London. Gigs and festivals going on in Camden with some amazing acts coming here from all around Europe and more. 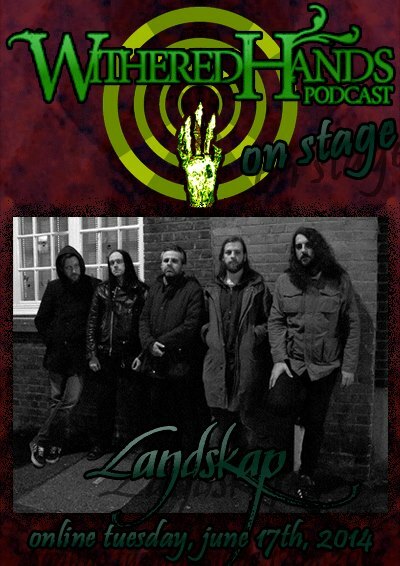 Between all of the shows we recorded and interviewed Landskap. This new band from London, child of some amazing european musicians already involved in amazing acts such as Dead Existence, Indesinence, Fen, Serpentcult and Pantheist, offered a great performance at the Underworld in occasion of the “Ouch My Generator” fest playing a unique mix of progrock, doom and psychedelia. We couldn’t expect any less considering the musicians involved in this project. So take a seat or plug in your headphones/ or both if this is the case and enjoy the wonders of Landskap. Be sure to check out https://www.facebook.com/LandskapUK where you can “Like” the band, get in contact and keep yourselve’s updated with all things Landskap!! Also check out http://landskap.bandcamp.com Where you can purchase/download the first album on the option of “Name your price” so go and get your ears wrapped around that. As for all of us here at The Withered Hands Podcast, Take care and doom on people!!! And if you don’t want to dooom on, then…..well….just live for the music, live for yourselves and live for each other! !